Mexico Ambassador to Canada Dionisio Perez Jacome says Mexico wants Canada included in whatever replaces NAFTA. BANFF, Alta. 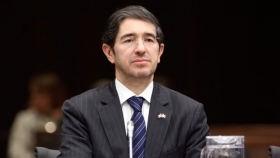 — Mexico will continue to support bringing Canada into its trade agreement with the United States even if its North American neighbours fail to reach an accord by the U.S. deadline of this weekend, Mexico’s ambassador says. The United States and Mexico are poised to present the text of their bilateral trade deal today. The U.S. Congress is pushing Canada to join the pact by a deadline of Sunday to allow Mexico's current government to sign the deal before it leaves office on Dec. 1. "We want the agreement to be trilateral," said ambassador Dionisio Perez Jacome after giving a speech at the Global Business Forum in Banff, Alta., on Thursday. "Hopefully Canada can be included already in the text. If not, then the process gets more complicated but it's also possible to come in sometimes, some days after." He said the new left-leaning Mexican government under Andres Manuel Lopez Obrador supports the bilateral deal with the U.S. and favours an open market-based economy. Earlier, David MacNaughton, Canadian ambassador to the U.S., said he doesn't think Canada should sign a deal it doesn't agree with in order to meet the deadline. He said a number of issues remain to be ironed out before a renegotiated NAFTA can be adopted, pointing out the need for a "robust dispute resolution mechanism" is highlighted by the recent imposition by the U.S. of tariffs against Canada for security reasons. "We're not going to be rushed into doing a bad deal," he said. In a presentation, Perez Jacome praised the "deep and excellent relations" between Canada and Mexico, pointing out that trade has grown nine-fold in the past 25 years.